Hmm, good! 6 oz. 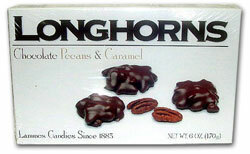 box of Lamme's milk chocolate covered pecans and chewy caramel, made right here in Texas! Such tasty goodness!